United Nations Secretary-General Ban Ki-moon today announced the appointment of Jamal Benomar of the United Kingdom as his Special Adviser, at the level of Under-Secretary-General. “Mr. Benomar is a veteran United Nations senior leader who brings to this position a deep understanding of political dialogue processes and international peacebuilding efforts,” said Mr. Ban in a statement issued by his spokesperson in New York. “He was the United Nations mediator in the negotiations that led to the Transition Agreement in 2011 and facilitated the positive conclusions of the National Dialogue Conference in 2014 and other agreements,” said the statement. Since he joined the UN in 1993, Mr. Benomar worked in a variety of capacities in the Organization including with the Office of the High Commissioner for Human Rights (OHCHR), the UN Development Programme (UNDP) and in the Department of Political Affairs. He also played a significant role as the Director of UN Peace Building Commission and Peace Building Support Office. Further, Mr. Benomar also served in Afghanistan and Iraq as the Secretary-General’s Envoy to support the National Dialogue Conference in 2004. The statement also said that prior to his career with the UN, Mr. Benomar was a director at the Carter Centre, where he worked closely with former United States President Jimmy Carter on human rights and mediation issues. Additionally, he also worked for Amnesty International in London. “In the course of his career, Mr. Benomar has advised on rule of law, governance and conflict resolution issues in over 30 countries,” said the statement. 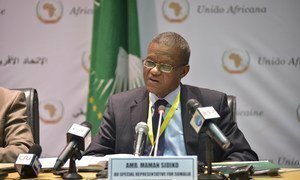 United Nations Secretary-General Ban Ki-moon has appointed Maman S. Sidikou of Niger as his new Special Representative for the Democratic Republic of the Congo (DRC) and Head of the UN Mission in the country, known as MONUSCO.